I thought i had seen everything a WWII and holocaust movie has to offer, but this one is different. Superb! The setting of this dark and disturbing fairytale is the end of the Second World War. After their Nazi parents are rounded up by the Allies, teenaged Lore, must lead her four younger brothers and sisters, through the forest to their grandmother’s house, some 900 kms away in Hamburg. Although i do read them, I’m not much of a sci-fi books fan. More of a consumer than a sci-fi book lover. So, even though i bought it on 22 August 2011 it took me almost two years to make the decision and move this little book from the Goodreads to-read shelf to the one just above it, the Read shelf. What i want to emphasize with this pointless intro is how not of a big sci-fi fan i am and whether this affected my enjoyment of The Windup Girl. It did and it didn’t. Whenever sci-fi writers start describing worlds, machines or species they usually lose me. For one thing i don’t have the imagination (and knowledge if you like) to follow what they are saying and i don’t command the english language well enough to understand what they are trying to say. That’s how The Windup Girl was in the beginning for me. Fortunately, it picked up from there. Letting go of the futuristic machines and species and introducing the characters in the story one by one and how they come to interact with one another. I can’t say i found all of these characters particularly fascinating apart from two (no, i am not going to spoil it further for you with my bias). However, i did appreciate the writer’s emphasis on scenes with lengthy, mostly engrossing conversations. This is usually with what i associate a great tv series. A good conversation. Also, the setting of a future Thailand and the geography around it was quite unique for me. 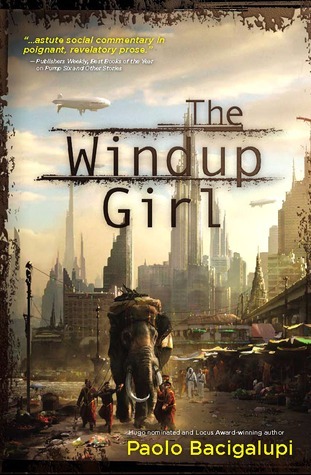 Now whenever Thailand comes up The Windup Girl inevitably will too and vice versa. There’s a good story here. Simple, yet gripping and it grapples with ideas and questions which are relevant today. There is hype around this book and i approached it with relatively high expectations. It’s not the best sci-fi book i’ve read. Far from it. This contributed to my initial disappointment. However, as i continued reading it i realised it was not hype. It was affection and that’s how i will remember The Windup Girl. I enjoyed Michael Lewis’ book and the film does it justice. Very well made. The story of Oakland A’s general manager Billy Beane’s successful attempt to put together a baseball club on a budget by employing computer-generated analysis to draft his players. For the past month or so i’ve started using youtube videos to get my exercise fix. I’ve been streaming them (via mob) on my tv which is pretty handy and relatively trouble free. The exercises i’ve been doing are more focused on toning, abs/obliques and low impact cardio. Most of these exercises involve no extra equipment apart from an exercise mat. I bought a physio ball more than a year ago but i never used it and recently acquired a medicine ball as well. I love the latter but i’ve been disappointed with the former. The physio ball also takes up a lot of space in the apartment so i’m thinking of getting rid of it. In order to keep my interest and motivation high for these exercises i’m switching the schedule a bit every other week and introducing new exercises. There is an abundance on excellent videos on Youtube. Fitness Bender for example have some great videos and are all available for free. My aim is to keep the different exercise schedules around 30-40mins with limited break time. These are two of my current favourite videos. In the first video i’ve substituted a few leg/calf/foot exercises with easier ones with less impact to minimise the pain. The final exercise in this video is simply fantastic. It’s called the “Push up planks” at 14:50. The second video it’s all about the abs/obliques and this is a tough one. I have yet to managed to do both rounds and all the 8 exercises (50 seconds each). In this video my favourite is “Plank Knee Tucks” at 3:36.